The All New, All Daring Delusional Honesty! : Evolution in Silver: An Interview with Greg Pak! This was a great interview Gary. I was wondering if you ever asked Greg Pak my question about if he read the Avengers issues with Prometheus in them. If so did he say if he or Fred Van Lente read them? If you haven't asked him yet,could you ask him on Twitter? Interesting interview, but I can't help but notice that you didn't so much as ask any questions regarding Incredible Hulks #622 or any other questions regarding our favorite green goliath. I'm still hoping for a rematch between Zeus and Hulk, but on their next encounter, Zeus is gonna fall! Gods are too damn arrogant for their own good, and I think that if anyone needs to knock the Sky-Fathers off their throne/pedastal, it's the Hulk. Though, I must admit. Silver Surfer #1 was a great start for Pak regarding our favorite herald of Galactus. I can only hope he keeps it interesting for the next four issues. Trust me, fellas--there will be some Hulkish follow-ups with Greg Pak soon. 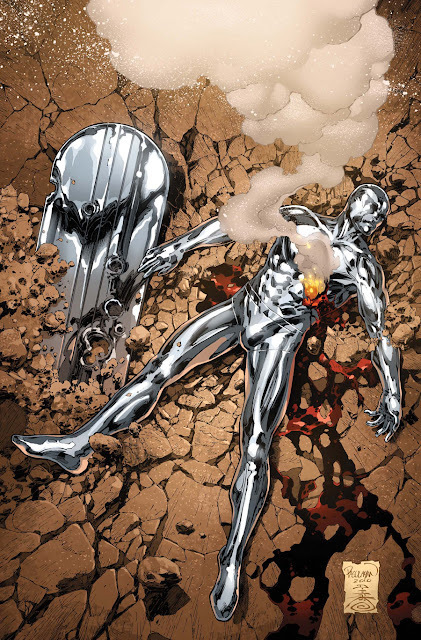 This time out, it was all about Silver Surfer! There will be so much more to discuss, since he's also working on a new Herc series, an Alpha Flight series, and there's that screenplay of his that Joe Dante's directing! Has you know I have nothing but faith in your abilities! Keep up thr good work!